Hi everyone! Today I have a gorgeous vampy polish to share with you. La Petite Robe Noire by Guerlain is by far my favourite perfume and I was excited to see that they have brought out a range of scented nail polish and lipsticks! My husband gave me this polish, Black Perfecto (007) and the Black Perfecto lipstick for my birthday and I couldn't wait to try them out! Black Perfecto is not actually black but rather a dark red black. In the shade or at arm's length it tends to appear black but it has an amazing deep red shimmer. On many of the promo pictures, it looks purple but I definitely think it looks more red than purple on the nail. The formula was really good though I don't have any other Guerlain polishes to compare to. The brush is wide and flat. At first I was worried it was a little too wide but after a couple of nails, I decided I quite liked it after all. I really love the packaging and how it looks like the perfume bottles. The only 'negative' thing I have to say about this polish is that I can't smell the perfume. It is supposed to be scented but I didnt smell anything at all. I even waited for ages before applying topcoat to see if the smell would become apparent later and left a couple of nails without topcoat to see. Unfortunately I couldn't detect a fragrance and neither could my husband. The lipstick is very well scented though in comparison. I'll be trying this out again to see because I have seen mixed reports on whether people can actually smell it or not! I'm not too disappointed though because the polish is lovely anyway, but it would have been cool to have my nails smell the same as my perfume! Hi everyone! Today I have a super pretty stamped mani to show you. Like just about everyone else I was excited to see that Essie were rereleasing Starry Starry Night as part of their Retro Revival collection. Of course I had to get a bottle! Although, like many others, I was disappointed to find that this version is by no means the same as the original, I do really like it as a stand alone polish. So let's just pretend that it's not a disappointment in comparison to the original and enjoy it for the lovely squishy blue glittery goodness that it is. I started out my mani with 2 coats of Starry Starry Night. I found the formula to be a little on the thicker side but it wasn't anything unmanageable. I really love the base colour of this polish and how the glitters peek through and create a starry look. To go with it, I just had to stamp using a design from the Moyou Enchanted 16 plate! This plate is one of my favourites in my collection and I love how pretty and delicate the designs are. I used Color Club Harp On It, a silver linear holographic, to stamp and then finished with topcoat. I used my clear stamper from Girly Bits again and I have to say that I have fallen in love with this stamper. It has completely changed stamping for me and I love being able to see exactly where I'm placing the image on my nail! Genius! What do you think of this mani? Did you get the rereleased version of Starry Starry Night? Hi everyone! Today is the last day of Spring with with The Digit-al Dozen and I've done another Easter egg inspired design today! I actually ended up using the Lime Crime Les Desserts d'Antoinette collection again because they are so perfect for these designs! Bright yet pastel! I started out my mani with 2 coats of Milky Ways, a gorgeous off white creme. I recently purchased a clear jelly stamper from Girly Bits and was dying to try it! This seemed like the perfect opportunity because I wanted to do some layered stamping to look like an Easter egg! I started out by stamping some stripes from the Moyou Pro XL 01 plate using other polishes from the Les Desserts d'Antoinette collection; Pastelchio (green), Lavendairy (purple), Peaches <3 Cream (orange), Once in a Blue Mousse (blue) and Parfait Day (pink). I then used a polkadot image from the same stamping plate and Crema de Limon, the yellow from the collection and then the same image again and a gold polish, Barry M Instant Nail Effects polish in Gold (320). The yellow stamping didn't show up as much as I would have liked but I like the effect of the layered stamps anyway. This definitely isn't my best stamping but the clear stamper was quite different to my super squishy usual one. I think my next attempt will be much better! It is definitely love and I'd definitely recommend the clear stamper! I think this will definitely make me like stamping more! Hi everyone! Today is already Day 3 of Digit-al Dozen Spring week and you'll be glad to see that I've not done more flowers!! When thinking of Spring, apart from flowers, I think Easter! Bunnies, chicks, chocolate and pretty decorated eggs! So I decided to do some Easter egg inspired nails with some pastel colours! The Lime Crime Les Desserts d'Antoinette collection was perfect for this! These are neon pastel cremes with good formulas that I love to use for nail art. For this design, I used 5 of the 7 colours in the collection (Once in a Blue Mousse (blue), Parfait Day (pink), Crema de Limon (yellow), Lavendairy (purple) and Peaches <3 Cream (orange) as well as vinyls from the Pshiiit Boutique (Pshiiit Stickers). I then applied my colours following this simple tutorial from my awesome friend and fellow Digit-al Dozen lady Shelly at Sassy Shelly! After creating the rainbow chevrons, I added a coat of China Glaze Fairy dust which is probably one of my favourite ever glitters. It looks fantastic over everything and adds the perfect hint of sparkle! I then finished with a coat of topcoat as usual. What do you think of this design? I think it is probably my favourite from this week and it really reminds me of Easter eggs! I will definitely be doing this design again with more colour combinations as well! Hi everyone! For Day 2 of Spring week, I have another flower design for you. Sorry I just can't help it! Spring makes me think of all flowers! I decided to do the super common daisy. I'm pretty sure everyone has sat on some grass and made a daisy chain at some point. They are like a teeny weedy version of my favourite flowers, Gerberas as well. I love how cheery they are! For my base, I used two coats of Fight The Fairies by Paint Box Polish. This is actually a custom created by Pam for my friend Kim (The Ides of Polish). I feel honoured to own this gorgeous glitterbomb as well! Fight The Fairies is a purple jelly base absolutely packed with holographic glitter. It is super sparkly!! For the daisies, I used acrylic paints (white, grey and two shades of yellow) and a fine detail brush. I finished off my mani with 2 coats of topcoat. One would probably have been alright but my favourite quick-dry topcoat (Revlon Quick Dry) has a thin formula so I wanted to be sure to have a smooth finish. I'm sorry this is a custom and therefore not available to purchase but Pam has made some other colours with a similar finish that you might like if you like this one! Hi everyone! It is Digit-al Dozen week again! 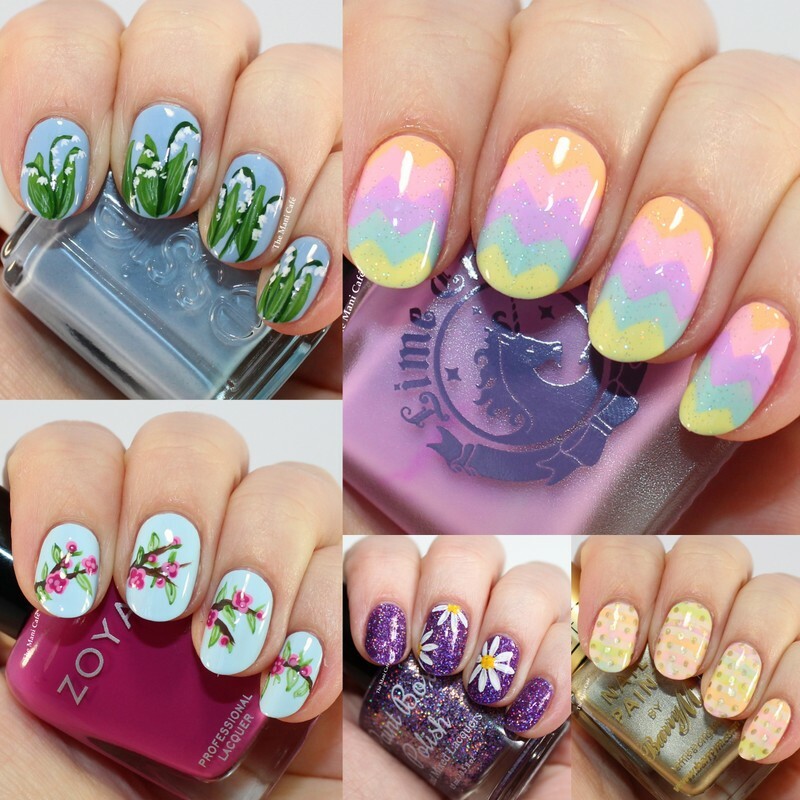 This month's theme is Spring! I'm looking forward to seeing lots of happy bright manis this week from all the ladies. I'm not-so-secretly hoping for lot of florals because that is soooo my thing! I'm starting off with a flower design today for Day 1! Each Spring, I enjoy seeing lots of Lily of the Valley! There is some in our garden and it appears here everywhere at florists. It is traditional on May 1st to give Lily of the Valley (muguet) for good luck! Apparently, a stem with 13 bells/flowers on it is considered particularly lucky! I started out my mani with 3 thin coats of Essie Bikini So Teeny, a pale blue with a subtle silver shimmer. This may be okay in two coats also but I preferred to use 3 thin ones for an even finish. I then used acrylic paints and a fine detail brush to freehand my flowers. I finished everything off with a coat of topcoat as always. I can't wait to see what everyone else has done for Day 1! Be sure to check them out as well! Hi everyone! Today I have some nail art for you and it is something a little bit different for me! I actually did this mani for Digit-al Dozen Nail Hero week last month (If you missed them you can check out my previous Digit-al Dozen posts here). I really enjoy following Kewpie Nail on Instagram and as soon as I saw this cute Barbapapa design, I knew I had to recreate it! I used the polish brushes to draw the basic shapes of the characters then used a fine brush and acrylic paints for the details. Do you like Barbapapa? I think it is a really cute cartoon and this was fun to do on my nails even if it isn't something I would necessarily wear as a full mani. Hi everyone! Today I'm excited to share this post because it involves a polish I wanted for a long time and finally got last week! YSL Première Neige is a gorgeous shimmer topcoat that I can't wait to try over all sorts of colours! For my first test with this one, I decided to wear it over Zoya Storm, also recently added to my collection. Storm is a gorgeous blue with a scattered holographic finish like one of my other favourite Zoya polishes, Aurora. The formula and application were perfect and I feel like this is a colour I will come back to a lot. I used 2 coats. I saw some swatches of the YSL online over various blue polishes and loved how it looked. I added one coat of Première Neige and then a coat of quick dry topcoat. This is a topcoat with shimmer that settles in the bottle so you have to shake it well to disperse before applying. The formula is thin and perfect for layering as intended. I wish I had another bottle of this already. I loved this combination and it was soooo sparkly! I think the shimmer and colour shift of the YSL will show more over darker shades and although this wasn't the perfect combo to show off Première Neige the most, I really loved wearing it. You can definitely expect to see more experiments with this topcoat here soon! Hi everyone! Today I have a simple swatch post for you of one of the colours that really sucked me into buying Chanel polishes! This stunner is Peridot (531) and it was one of my first Chanel polishes. I absolutely fell in love with the colour and how it changes in different lighting. I know pretty much everyone has done duochromes and multichromes since but I don't love this one any less! I pulled this out of my Helmer to wear when I needed a quick and plain mani but I still wanted something a bit more 'special'. The formula and application are great on this one, as I expect from Chanel basically. I used 3 thin coats because of a pesky ridge on one of my nails that showed a little with two. I finished with topcoat as usual. What do you think of this one? Do you like Chanel polishes as well?